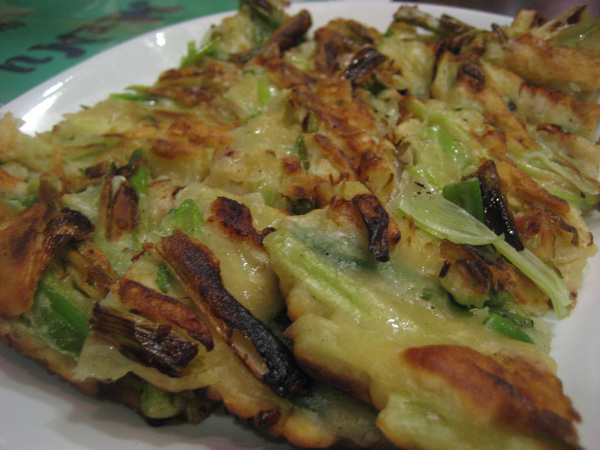 As promised, I'd love it if LTHers would join me for a meal of pajeon, sundubu and other deliciousness at Cho Jung on Tuesday, October 13th at 7pm. I hope this hour gives city people enough time to get out to Glenview. Please post here if you can make it so that I can make arrangements with the restaurant. They shall not begin to compensate for my panchan thirst. Let the table run, er, red with kimchi. I'm in. I would love to, hope the restaurant manages to hang on until then! Mike G wrote: I would love to, hope the restaurant manages to hang on until then! I don't think they are in any danger of closing. Nearly every time I've been there, it's been packed or at least moderately busy. stevez wrote: I don't think they are in any danger of closing. Nearly every time I've been there, it's been packed or at least moderately busy. Cho Jung was busy last night, almost, but not quite, a full house. I'll be there. That's on the old A&P site, right? I'll be there. 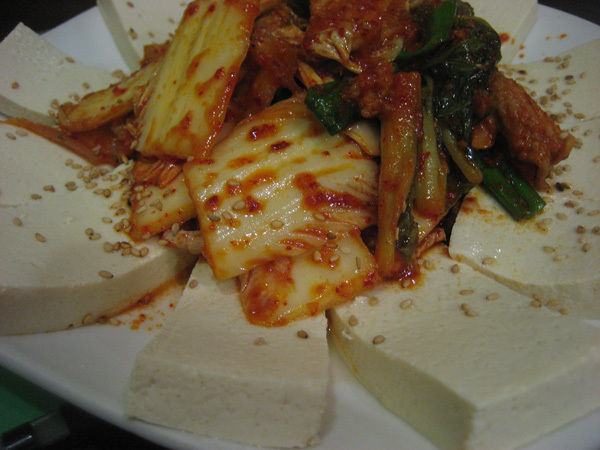 I had a wonderful bowl of kimchi jigae for lunch yesterday and am looking forward to trying more dishes. Me, please! Thanks for setting this up. I would like to join you. Thanks for coordinating this dinner. I would love to join you! Sounds great. Looks awesome! No jobs! We're in. Is there room for one more? Thanks! Wouldn't you know it--the one evening I'm not online checking the LTH site.... Hope there is room for 1 more--me! If there's a spot available, I'm interested in joining the group. Terrific response! I'm going to close off the dinner now and start a waitlist since I wouldn't want us to overwhelm the restaurant. Let me know if you'd like to be added to the waitlist. I'll call the restaurant today to give an early heads-up and then caller closer to the date with our final number. Last edited by happy_stomach on October 5th, 2009, 10:48 am, edited 1 time in total. I'd love to get on that wait list. I am in walking distance and would love to be part of dinner. Put me on the wait list or let us open another table. We've had a cancellation. Khaopaat, you're in. Bump. Just a reminder that this dinner is tomorrow. Unfortunately, I am still running a fever and for all intents and purposes am an invalid so cannot make the outing. I will most certainly be there in spirit though. gastro gnome has auditioned fair and square, and he will be playing the part of happy_stomach for the evening and has taken over advance communication with the restaurant. I will wait with bated breath (thank you, coughy flu) for the reports. Unfortunately, the figs have to pull out too. We have to work, tis the season. GAF - hope you can still make it! The restaurant was closed today so I couldn't call to finalize numbers. If two more people were on the fence and interested in joining in, we now have the room. There will be no set menu for this event. I'm no Korean food expert and haven't been to the restaurant, so any input will be welcome. I will let them know that we will definitely be interested in some pajeon, sundubu jigae, and a fish stew or two. Bring your appetite. Leave your kimchi phobia. I am so, so sorry, but I just found out that I need to work late this evening. My apologies. Hope all of you have a delicious dinner. A friend of mine would like to join us. Please add +1. I confirmed with the restaurant that we would be 12(ish). See you all soon. This was a warm, subdued evening of generous eating with good hosts and company, a nice antidote to a chilly October night. Most importantly, we hope happy_stomach found her own antidote with rest and birria! Thanks to gastro gnome and Ronnie for guiding the ordering. 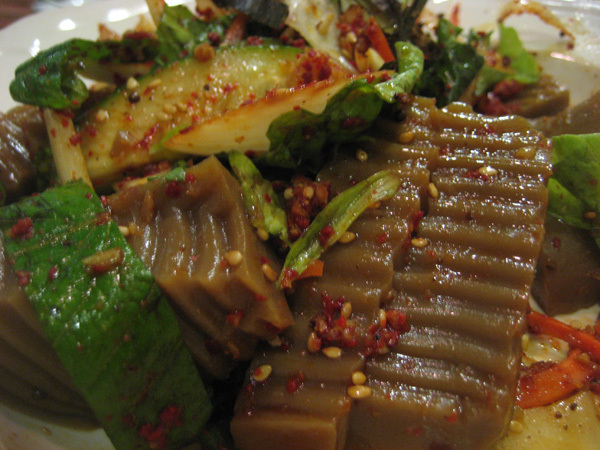 I may be in the minority opinion that the dotorimuk (acorn jelly salad) was the strongest showing. The panchan offerings were exceptional, and the soy paste soup with hot peppers and tofu was very nice. I am biased on the pancakes and dumplings, liking them much better at other places I encountered first, and thought the meats were decent but undistinguished, especially at the top-tier Korean BBQ prices and double-order requirement. 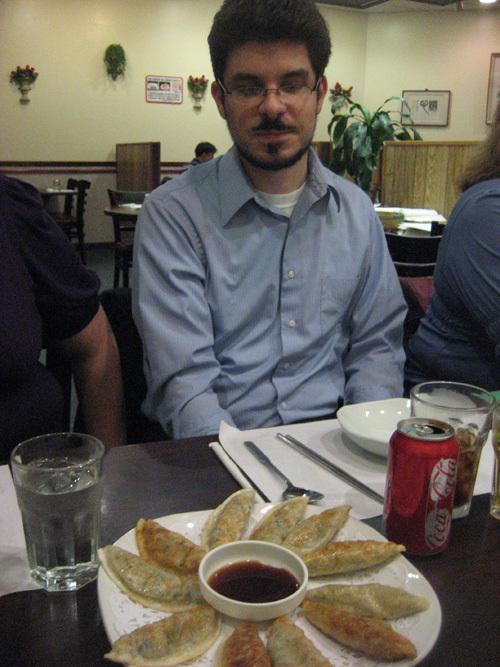 I'll happily return for the veggie and fruit pickles, tofu dishes, and our good-natured waiter, who rocked. Like I told Ronnie, I only put my name on the list due to a blind lust for Korean food coupled with an utter lack of understanding regarding the location of Glenview. Fortunately, the evening was more than worth the hour of rush-hour traffic. It was great chatting with folks, and the waiter was indeed excellent. I was a big fan of (and please correct me if I get any of the names wrong, I'm relying heavily on Google) dubu kimchi (tofu along side a mound of kimchi and spicy pork), altang (salted, dried pollack roe soup), both the haemul pajeon and kimchi jeon, and absolutely loved the myulchi bokeum (tiny, dried baby anchovies...who'd'a thought) from the panchan spread. 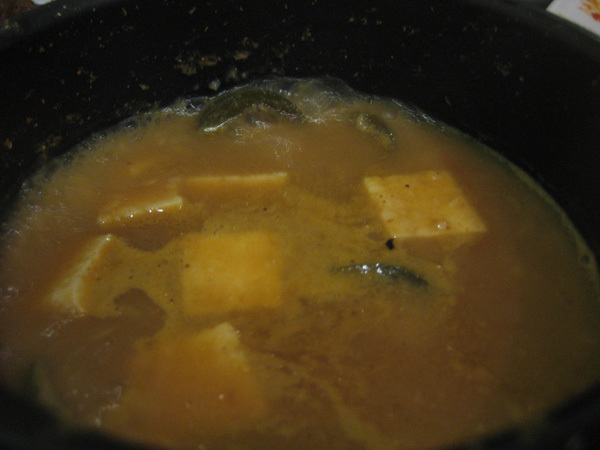 The boiling tofu/soy soups brought toward the end of the meal (can't remember or find the Korean name) was excellent also. The acorn jelly, I could take or leave...I really liked the spicy, tangy salad that came with it, but the jelly itself seemed pretty tasteless to me. There was most of an order leftover on our side of the table, you should have taken it to-go! The haemul jeongol (elaborate seafood & noodle casserole) was probably my least favorite dish of the night, and even that wasn't terrible. The better of two pancakes; supposedly seafood, but not that I saw. Much better than the kim chi one, which was just on the nicer side of rank. The acorn starch jelly. (I wonder-- acorns, or acorn squash?) The jelly was flavorless, I thought, but I agree the salad was good. Easily my favorite dish-- the chevre-like texture of firm tofu, sweetish pork, and greens with hot sauce (I believe the natives call it kimchi) were a nice, uniquely Korean combination. This soup was a surprise strong contender showing up at the end; a lot of deep funky flavor in it. 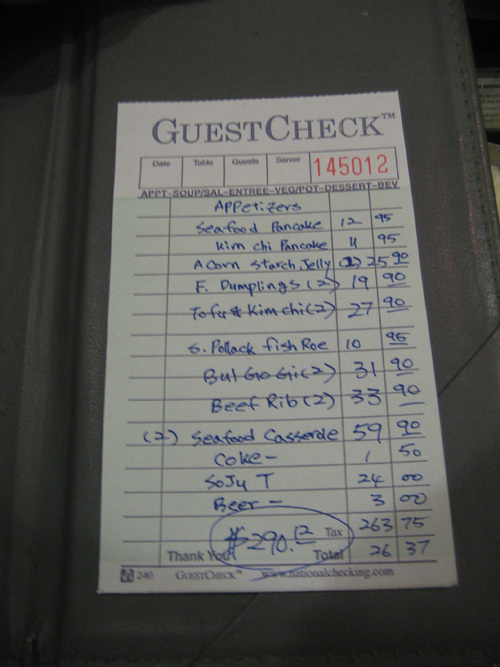 The check, written in astonishingly clear handwriting. I enjoyed this meal but was well shy of rapturous about it. Yes, the panchan is quite probably the best selection in the area, with things you don't often see (the fish) and one really novel and delightful combination (apples in soy sauce... way better as a combination than it sounds). But panchan is sort of like the cole slaw at the barbecue joint to me, good or bad it's not exactly why you're there. And this is not a barbecue joint, which I must admit, at the risk of philistinism, is a disappointment to me, I'm most interested in Korean food where there's flaming coals a few inches from my plate. Anyway, they seem like nice folks trying harder than many Korean spots, the waiter was very good, and the place was very empty, I'm glad the LTH community as a whole got the chance to try it because going sooner rather than later may be good advice. Last night was another lovely LTH event with much eating, lively conversation and some good food. As I always like to do, a rehash of conversation topics overhead: an incongruous twitter-length review of War & Peace, pre-AOL email behavior, a half-million dollar green card, the dangerous nature of pickling, the enigmatic meaning of this emoticom and, surprisingly, sausage pizza. I do admit that I came into this dinner with some expectations. But expectations can be unfair: anyone expecting me to pull off a happy_stomach performance was sorely disappointed. But we have to thank her for giving us all reason to get together and to her speedy recovery. First off, I will join with others in complimenting our joke-cracking, chair-lifting, clean-plate-providing waiter Tom. He and the other restaurant staff (of one?) handled our large party with aplomb, making recommendations, pacing the evening, topping off hot tea and water glasses regularly and dealing piping hot bowls of rice late into the dinner. My impression of the food was mixed. There were highs (both pajeons, pork & tofu, panchan), lows (seafood casserole) and decided ehhhs (acorn starch, all of the 'grilled' meats). I did enjoy both of the pancakes (though I don't know if anyone really found any seafood), but fried dough is a crowd pleaser. My favorite dish was also the tofu and spicy pork, although I thought that it could have done with a bit more heat and a bit less sweetness. Nothing billed as "spicy" was overly so, although I'm not sure if we got the regular treatment. Pungent is a fine way to describe the soybean soup we were served towards the end. 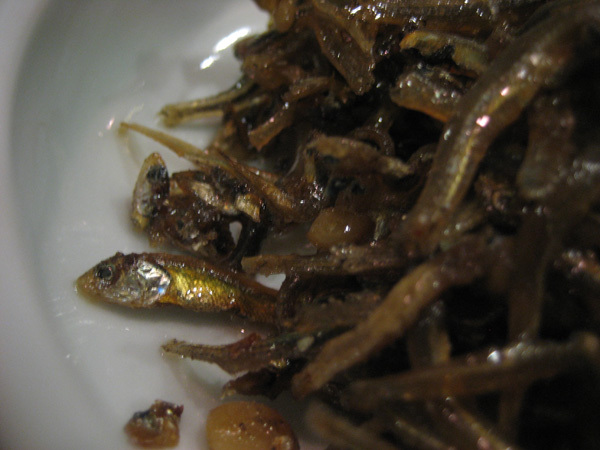 Funky miso shiru might be another way. I liked this but was a bit too full to appreciate it. I think the seafood casserole was a disappointment. Much of the seafood was overcooked and it deteriorated quickly with noodles gumming up and the 'spicy' sauce reducing down to a paste. It did include some odd sea creatures, some of which Tom could not identify, didn't necessarily like, but assured us were "from the sea." I'm not sure we ordered to this restaurant's strengths, to be quite honest. I sure didn't know a lot about the gems of the menu, save for what was posted here. And I had a hard time figuring out which item on the menu was the sundubu jigae, the most praised of the items. Suffice it to say, I think we took some recommendations from Tom (the seafood casserole) and pointed to some menu items that looked interesting (acorn starch). If I gather, this place's best foot might be soups, but these seemed to come in individual sized portions that would have been difficult to share. 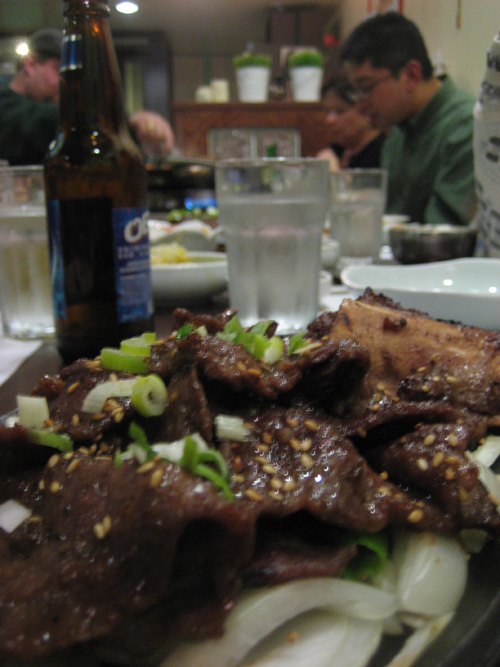 Anyway, the bulgogi and kalbi were decidedly average. If you go, I would pass on these in favor of other menu items. I don't have a ton of experience with Korean barbecue, but a live fire usually means a good product. Griddled versions don't really do it for me. I had a soul-warming meal on a cold, rainy day in Korea that consisted of dolsot bibimbap and a gingery chicken soup with bone-in chicken parts that stands out in my mind - so I can definitely dig non Korean-bbq food. I look forward to returning here as the weather gets colder and diving into some soups and other menu items.